There really is no such thing as a ‘local’ story any more — news goes global at the flick of a switch. Our article about repair work at Heritage Wharf — specifically, the use of ungalvanized rebar — caught the attention of the non-profit International Zinc Association (IZA), based in Brussels. Rebar is reinforcing steel and galvanizing it provides an additional coating of zinc to thwart corrosion. The IZA says galvanized rebar is “more robust” and points out that it has been used in Bermuda for the past 50 years. We reported last month that Government decided to use ungalvanized rebar at the wharf — even though galvanized rebar is specified in the Building Code — because it would be more effective and quicker. We also quoted the concerns of local, veteran marine engineers. Mechanical Engineer William Marques also questions the decision. As Director of Market Development, Brazil, for the IZA, he promotes the use of galvanized rebar. Over a period of 50 years, the Bermuda Ministry of Works and Engineering has exclusively specified hot dip galvanized reinforcement for all of its construction works. The climate is sub-tropical with a high average relative humidity of 80 per cent. No point in the islands is more than one kilometre from the sea and salt spray and salt-laden air is a constant challenge. The presence of high levels of chlorides, both from the environment and the use of coral aggregates in the manufacture of concrete, was known to be particularly corrosive not only to exposed steel but also to conventional reinforced concrete which often showed corrosion and spalling within two-to-three years. To counter this, galvanized reinforcement has been very widely used in a range of concrete construction [projects]. Periodic surveys of these structures, some 40 years or more old, have consistently shown that galvanizing of reinforcement provides long-term corrosion protection in concrete in these aggressive conditions of marine environments. 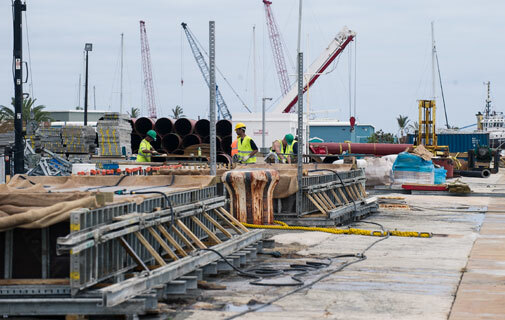 All docks, jetties, bridge decks, substructures and other infrastructure in Bermuda are, as a matter of course, constructed with galvanized rebar. A 1995 inspection and coring of the then 42-year-old Longbird Bridge revealed that the galvanized rebar still had a zinc coating thickness well in excess of a new hot dip galvanized coating specification, at concrete chloride levels ranging from 3 to 9 lb/yd3 (1 to 4 kg/m3). Furthermore, detailed examination of concrete cores from these structures discovered that the zinc corrosion products that did form had migrated a considerable distance (about 0.4mm) beyond the zinc/concrete interface into the surrounding concrete matrix with no visible effect on the concrete. Studies show that in good quality concrete that is well compacted, cured and of adequate cover, galvanized bar survives for extended periods of time and offers a cost effective method of corrosion protection. In poor quality concrete, however, particularly those with high water/cement ratios and low cover over the reinforcement, galvanizing will delay the onset of chloride induced corrosion of the reinforcement, but this may be of limited benefit. So, using galvanized rebar is a more robust approach that mitigates any concrete deficiencies and in the end may be less expensive when we think in long term life of constructions free of maintenance. ... The most cost effective and efficient method of minimizing the risk of rebar corrosion is to ensure that the concrete cover over the reinforcement is of adequate thickness and that the concrete itself is dense and impermeable. Another important line of defense is protecting the rebar itself by hot dip galvanizing. Hot dip galvanized coatings form an impervious metallic zinc and zinc alloy barrier around the steel that isolates the steel surface from the surrounding concrete. • The zinc coating provides corrosion protection of the rebar prior to it being embedded in concrete. These characteristics of galvanized rebar greatly reduce the risk of rebar corrosion that causes rust staining, cracking and spalling of the concrete.